The collapse of the Soviet Union and changes in the world order defined the 1990s, a decade also characterized by the containment of localized fighting and a revised naval strategy. Naval and naval air power played a significant part in the liberation of Kuwait in 1991. During the rest of the decade, naval aviation patrolled Iraqi airspace and supported UN-imposed sanctions as well as limiting the Iraqi threat to minorities within the country and to their neighbors across the Middle East. The fall of the USSR left the United States as the world’s only superpower, but the new global order presented regional and transnational rather than world threats as challenges shifted from political conflicts back to wars of tribes and faith. In response, the Navy developed a new strategy promulgated in a white paper entitled “ . . . From the Sea,” which emphasized littoral warfare (along coastlines) and maneuver from the sea. The new geopolitical situation also called for the largest drawdown for the fleet since World War II, and many naval aviation squadrons were consequently disestablished, reorganized, or consolidated. Furthermore, the Navy ended 42 years of modern support of Antarctic research. The breakup of the composite Yugoslav state into constituent republics presented the first major challenge to the new strategy. Aircraft carriers kept watch over the situation from the Adriatic Sea and supported Operation Provide Promise, the UN relief effort, and Operation Deny Flight, which monitored the air space over Bosnia-Herzegovina to prevent the warring parties from using their air strength. The changes in the global balance of power had also enabled Muslim extremists to rise to power. One of their primary goals was to drive U.S. armed forces from Saudi Arabia and its neighboring countries. 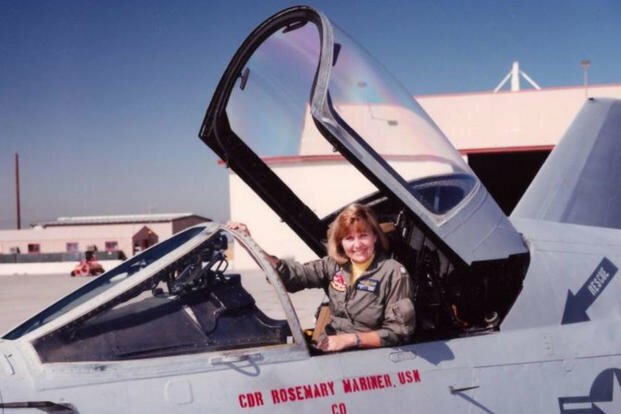 The decade also marked a first for women when, in April 1993, Secretary of Defense Leslie Aspin overcame most of the restrictions that prohibited women from engaging in aerial and naval combat. Later in the year, Congress supported the secretary’s decision to allow women in combat by repealing the Combat Exclusion Law. In October 1994, Dwight D. Eisenhower (CVN-69) became the first carrier to deploy with women permanently assigned on board. 18 May 1990—Night attack F/A-18Ds, the first two-seat Hornets designated to fly tactical as opposed to training missions, began service at MCAS El Toro, California. They replaced A-6 Intruders as the Marines’ day/night bombers. 12 July 1990—Cmdr. Rosemary B. Mariner relieved Cmdr. Charles H. Smith as commanding officer of VAQ-34, becoming the first woman to command an operational aviation squadron. 2 August 1990—Iraq invaded Kuwait. Independence (CV-62) sailed in the Indian Ocean, Dwight D. Eisenhower (CVN-69) steamed in the Mediterranean Sea, and eight Middle East Force ships operated in the Persian Gulf. Independence was directed to proceed to the northern Arabian Sea to support what subsequently became Operation Desert Shield, a UN-sanctioned economic blockade of Iraq by a coalition that eventually comprised 29 nations. 16 January 1991—President George H.W. Bush addressed the nation and announced the commencement of Operation Desert Storm—the liberation of Kuwait. 18 January 1991—VA-35 A-6E crews, embarked on board Saratoga (CV-60), used night vision goggles in battle for the first time in the squadron’s history during initial strikes against the Iraqis. 27 February 1991—At 9 p.m. EST, President George H.W. Bush declared that the Allies had liberated Kuwait, ending the Persian Gulf War. At midnight EST, all U.S. and coalition forces were to suspend further offensive combat operations. 12 April 1993—Aircraft from Theodore Roosevelt (CVN-71) and NATO forces begin enforcing the no-fly zone over Bosnia in Operation Deny Flight. 21 February 1994—Lt. Shannon L. Workman of VAQ-130, embarked on board Dwight D. Eisenhower (CVN-69), became the first female combat pilot to successfully pass fleet carrier qualifications. She was slated as one of four female aviators to deploy to Dwight D. Eisenhower in October. 2 March 1995—Space shuttle Endeavour launched from John F. Kennedy Space Center, Florida, on mission STS-67. Naval aviator Cmdr. Stephen S. Oswald, USNR, commanded the mission, and Lt. Cmdr. Wendy B. Lawrence, the first female Naval Academy graduate astronaut, also became the first female naval aviator in space when she launched as a crewmember. On 18 March, Endeavour touched down at Edwards AFB, California. 30 August 1995—Theodore Roosevelt (CVN-71) launched the initial NATO strikes against the Serbs in Bosnia-Herzegovina that began Operation Deliberate Force — aerial attacks to reduce Serbian military capabilities to threaten safe areas, UN peacekeepers, and humanitarian aid workers. Targets included enemy field forces and heavy weapons, command and control facilities, direct and essential military support facilities, supporting infrastructure, and lines of communication in the southeast of the country. The strike consisted of two waves of four F-14A Tomcats of VF-41; 31 F/A-18C Hornets of VFA-15 and -87 and VMFA-312; and two EA-6Bs; supported by other Prowlers from Aviano AB Italy. During the second wave, the ship also launched an S-3B Viking of VS-24 and an ES-3A Shadow. Five echelons of allied strikes followed the naval aircraft with attacks on targets in and around Sarajevo. Through 4 September, aircraft flew 492 sorties from Theodore Roosevelt. 20 February 1998—The Navy ended 42 years of modern support of Antarctic research and Operation Deep Freeze with the disestablishment of Naval Support Unit Antarctica. The service transferred the mission to the 109th Mobility Air Wing, New York Air National Guard, but provided limited flight support to the program throughout the 1998–1999 research season. 16 December 1998—The coalition launched Operation Desert Fox against the Iraqis. 24 March 1999— On this date, after diplomatic efforts to counter what Serbian President Slobodan Milosevic termed “cleansing” of ethnic Albanians from Kosovo collapsed, NATO began Operation Allied Force—an air campaign to reduce the ability of the Serbs to sustain their operations. Naval aviation contributed land-based EA-6B Prowlers, EP-3E Aries IIs and F/A-18D Hornets. Allied aircraft dropped Joint Direct Attack Munitions (JDAMs) operationally for the first time. Additional aircraft involved included five Antisurface Warfare Improvement Program–modified P-3C Orions of VP-5 equipped with synthetic aperture radar and AGM-84E SLAM (Standoff Land Attack Missiles), and RQ-1A Predator camera-carrying unmanned aerial vehicles.